I was a big Lovecraft fan as a young person, and now I appreciate his influence on the genre – great post! I must confess I didn’t stumble upon HPL until about 10 years ago. An incredible talent. 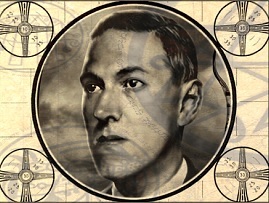 A lot of people see Lovecraft as a science fiction horror writer, but in my mind he is an excellent Gothic writer, using all the Gothic elements, the supernatural, the unknown, man powerless in the face of nature, madness, and strong emotion. Lovecraft can give me chills like no other. It’s his sense of impending doom and the unknown that truly brings on a feeling of unease, feelings we face in life. He has certainly been an influence on my writing. His broad knowledge of science and the supernatural was amazing. It’s odd that such a somber voice could entertain and make you come back for more. It worked on me! A somber voice indeed. And you’re right. It is strange that we would come back for more. Maybe it’s because reading depressing literature is a form of therapy to deal with a depressing world. Only read a selection of short stories, but made an impact. Great post on someone whose work I’ve always loved and good to remember him. Also good to remember his dark side though – he had some pretty ugly views on a series of social issues.